White Cube Mason’s Yard opened in 2006, the first free-standing structure to be built in the historic St James's area for over 30 years. 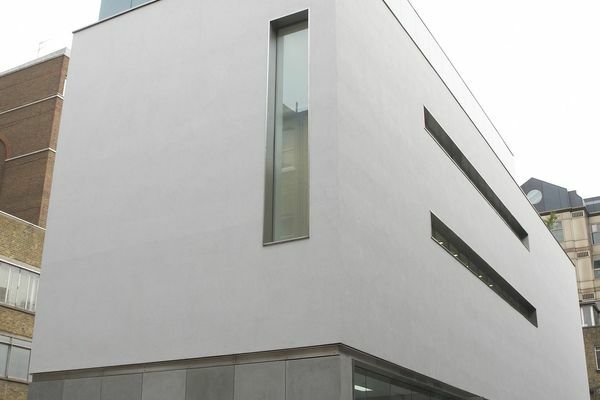 The building provides 4000 sq ft of gallery space, used for White Cube’s expanding artist programme. White Cube Mason's Yard opened in September 2006 in a courtyard off Duke Street St James's, nearby to the original White Cube space. The building, constructed on the site of an electricity sub-station and designed by London based MRJ Rundell & Associates, is the first free-standing structure to be built in the historic St James's area for more than 30 years. The building houses two major galleries that provide a total of 4000 sq ft of exhibition space, comprising a ground floor gallery on street level and a double-height, naturally-lit basement gallery. The design was developed to respect the key qualities of discretion and reserve that form the character of St James’s. Mason’s Yard is entered though a number of footpaths and covered passageways. Within an array of mismatched brick structures which comprise the perimeter of the courtyard, White Cube’s formal restraint creates a contrast while retaining the core characteristic of discretion. At ground level concrete panels wrap around the base of the structure. Above the concrete the rendered volume is cut with a series of precise light slots. A glass box extends further above the render. The project required the excavation of an eight-metre deep basement to provide a large underground gallery which receives natural light through a pair of long slots cut into the courtyard paving. On ground level the building has a gallery directly accessed from the courtyard with offices, private viewing rooms and a roof terrace located on the three upper levels. The project also included a complete resurfacing of the courtyard that surrounds the gallery. Used for White Cube's expanding programme of exhibitions, White Cube Mason's Yard has hosted a wide range of exhibitions by international artists including Andreas Gursky, Georg Baselitz, Jeff Wall, Anselm Kiefer, Robert Irwin and Miroslaw Balka. The gallery opened with an inaugural exhibition by Mexican artist Gabriel Orozco. White Cube Mason’s Yard presents a solo exhibition of new paintings by Julie Mehretu from 21 September – 3 November 2018. Based on events ranging from the Charlottesville riots to the Catalonian election, the new works radiate a sense of urgency in troubled times through Meheretu's signature abstract language. Mehretu was born in Addis Ababa in 1970 and lives and works in New York.